This wreath is inspired by the scene in Harry Potter where the letters are flying through the air at the Dursley's house. It's such a whimsical scene, but also so heartwarming to watch a little boy realize someone cares for him so much. 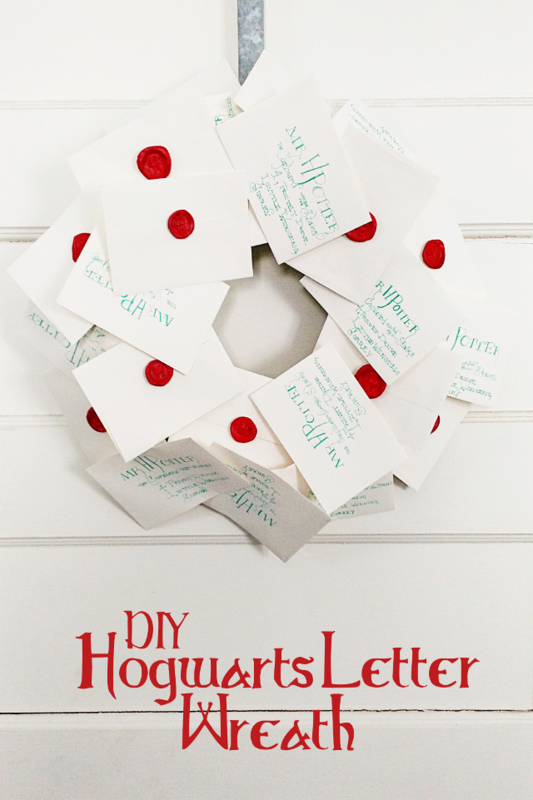 There's something about the warm fuzzy feeling I get from Harry Potter that matches up with how I feel about Christmas, so I feel like this is a perfect DIY for this season. 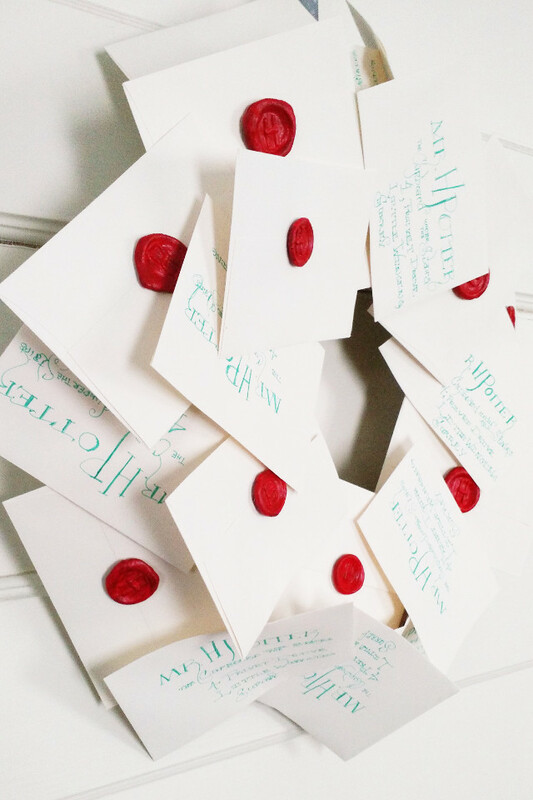 For this project you will be making around 30 envelopes, half of them with the front facing front (addresses) and half of them back facing front (wax seals). 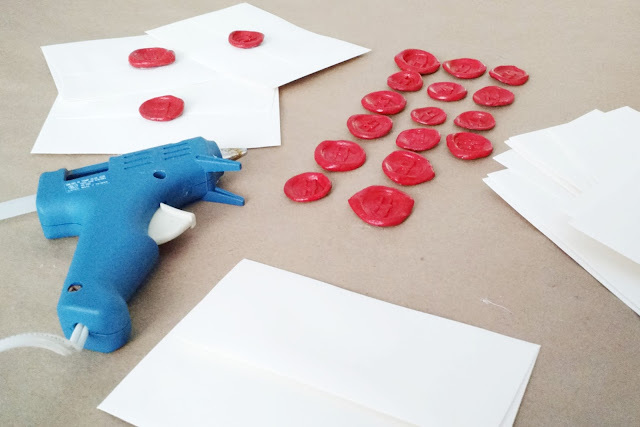 Step one: Your "wax seals" will take a little while to dry so it's best to make them first. I chose Model Magic for this step because it dries fairly quickly and the end result is incredibly lightweight. To create the seals, I rolled out a disk of white Model Magic about a nickel wide then squished it with a spray bottle cap. To make the center I used three pieces of a thin strip of dough to form an H and lightly pushed it into the center. For my small wreath I used around 15 seals. Step two: Time to address your envelopes! You will be addressing half of the envelopes you have (I made 15). I tried to remain authentic to the movie, but it would be so cute to use your child's name instead! If handwriting these envelopes intimidates you, there are ways to simplify it. The first line is the biggest, and the rest are smaller. If you are feeling brave, the H and the P are a little fancier than the rest of the letters. Honestly, as long as you get the format of name, specific location (i.e. "cupboard under the stairs"), and then the normal address underneath, it will look great! Once all the envelopes are on the wreath, no one will notice if you've made a small mistake. Believe me, I made plenty. 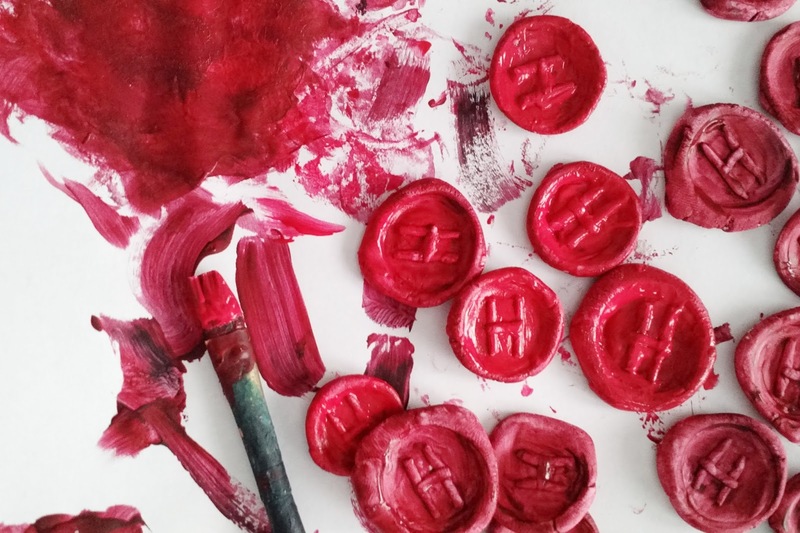 Step three: Paint your seals! To get the perfect shade of dark red I used a combination of a very small amount of black and a much larger amount of red paint. It took a few layers to get the color right. Make sure to use a glossy acrylic as your final layer to achieve the wax seal look. Step four: Get your wire ready. 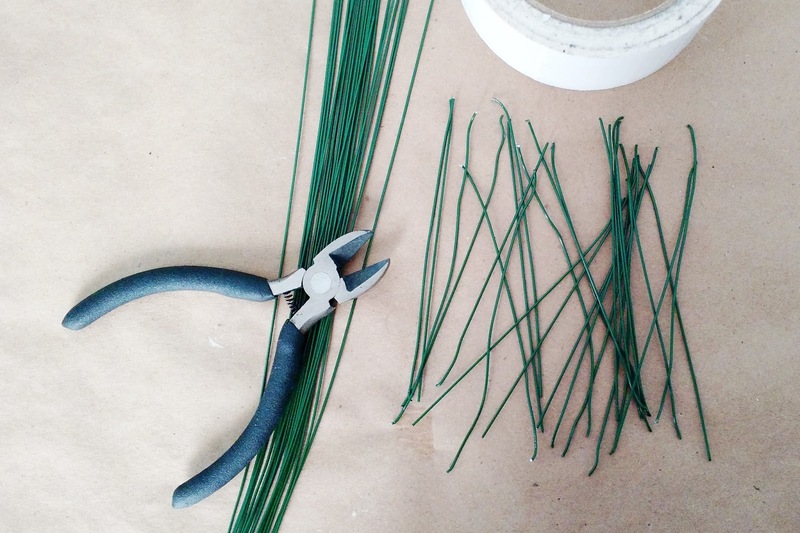 For the size of envelopes and wreath I had I cut 30 roughly 3-inch strips. They don't have to be any specific length, so you don't have to bother measuring if you don't want to. Step four: Time to finish your stack of envelopes. You'll be hot gluing your seals to the back of the remaining envelopes. 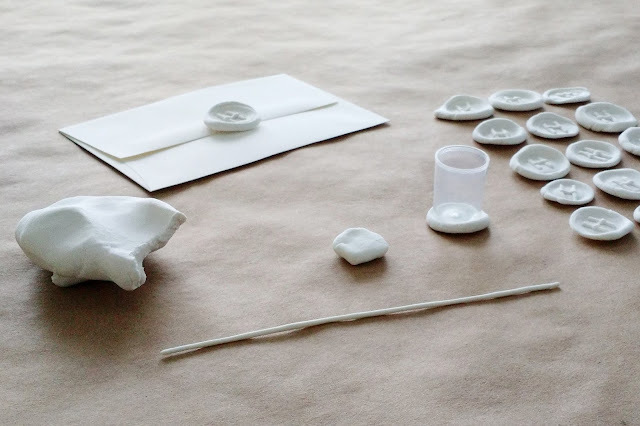 Seal the envelope, then dab some hot glue onto your "wax" seal. Place it in the center of the flap, and let dry. 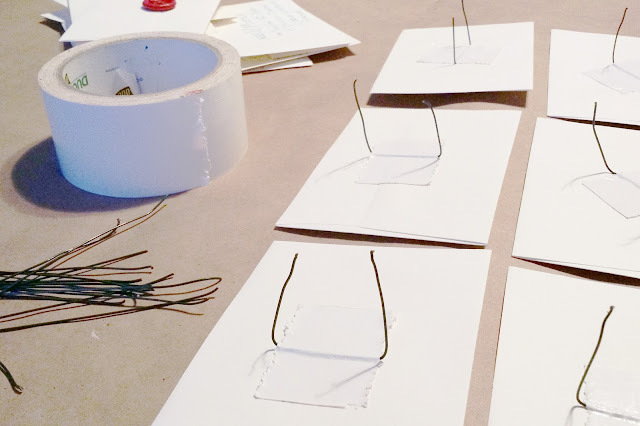 Step five: To prepare your envelopes to be attached to your wreath, you will need to tape a wire to the back of the envelope (which on the seal envelopes will actually be the front.) I used about an inch of duct tape in the center of the floral wire to attach it, then bent up the sides. We are trying to create two points for the envelope to attach to wreath. This will give us more stability and control over the angle of the letters. I think it's better to leave a few of the envelopes without wires at this stage so you can specifically place the wires where you need them while you're constructing the project. Step six: This is by far the most daunting step, but it's not as hard as it seems. First, set out a rough design of where you want the envelopes to go. A few things to keep in mind: you want your envelopes to be a little chaotic, it will make the wreath look fuller. To do this, make sure you are placing them at different angles and even putting some upside-down. Also, remember to alternate envelopes with seals and envelopes with addresses, it will help guide the eye around the wreath when someone looks at it. When you are happy with the layout, all you have to do is push the floral wire into the foam one by one. 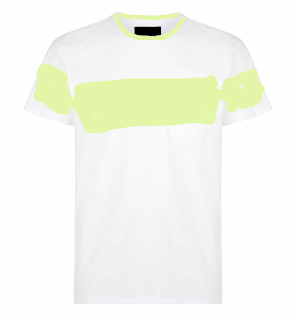 As you can see, the back will look a little ugly. Don't be afraid to add and take away as you go! I even found a few bare spots after I had hung the wreath, so I took it down and added a couple of envelopes. 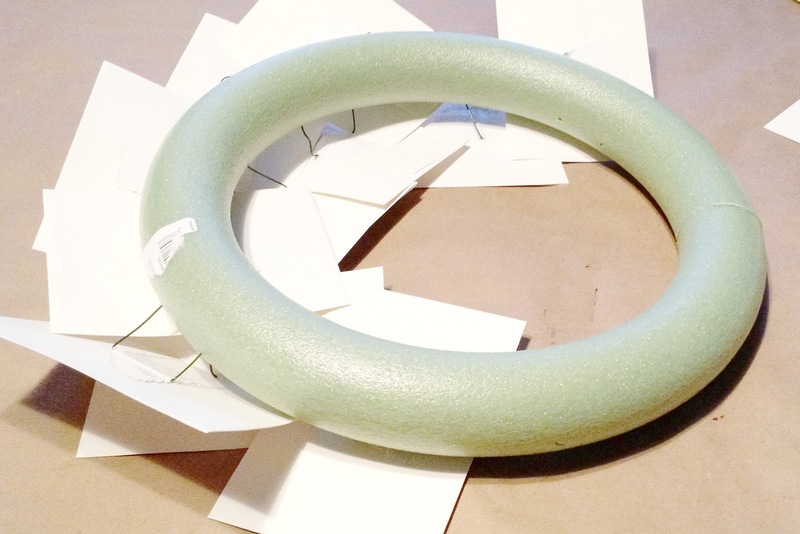 Step seven: Wrap some floral wire around your foam to give your wreath something to hang on. And you're done! I'm very happy with how this project turned out. It was much cheaper than a real wreath would be, and I can keep it to hang up for years to come. I love that it's a subtle nod to one of my favorite books, but it would be just as beautiful if it was done with another theme. 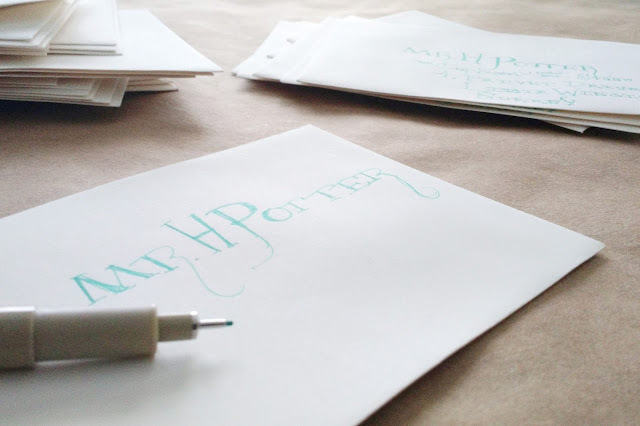 Love letters could be so cute, and a travel and air mail theme would be gorgeous. 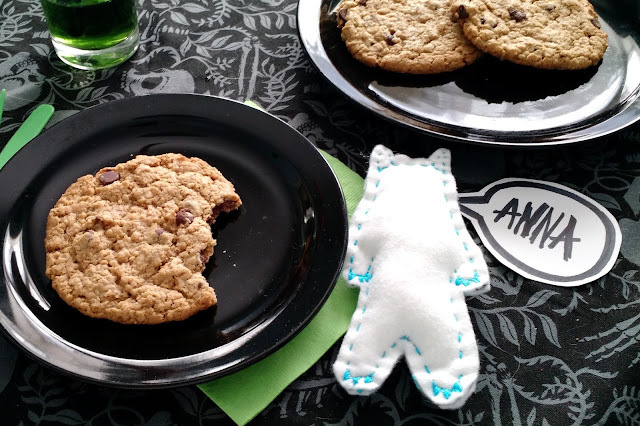 be sure to check out my Monster Book Snacks! 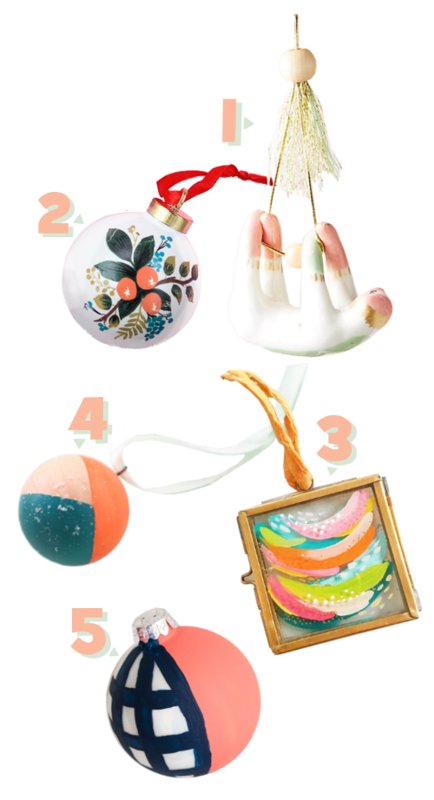 So while I've been planning this year's tree, which has been a fun new experience for me, I've found a TON of cute ornaments. So here are 10 of them. You see the posts all over Pinterest: 25 Newborn Things You Can't Live Without, 10 Items You Need Before You Come Home From the Hospital, or 16 Items Your Baby Will Thank You For. Eventually, though, for some reason, every single one of these features a Dock-A-Tot. I'm sure that these wonderful contraptions are incredibly safe and amazingly helpful, but who has the money for a $250 personal inflatable pool? So here is my contribution to the "things I couldn't live without" lists. Except, me being the cheap person I am, everything is affordable. Even the big things. And everything is something we REALLY used. Like every day. 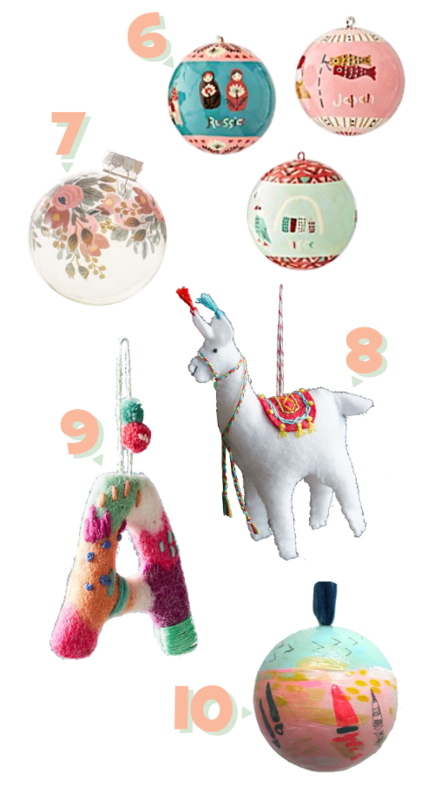 The basics: When we were shopping around for baby stuff, we were looking at price, ratings, and practicality. There were a few things I wanted to splurge on, and a few things that I was pretty sure we could get away with not spending so much. But I knew there were four things we would absolutely have to have. For the bassinet, we chose the Arm's Reach Co-Sleeper ($190). It is the most pricey thing on the list, but so far I feel it's been worth it. I love that I can pull the edge down, it allows me to see him easily even while I'm lying down, and getting him out is a breeze. The Summer Infant Changing Pad ($15) is soft but waterproof, and we were able to construct a frame for our dresser turned changing table easily. For our car seat and stroller we chose the Graco Click Connect system, which is so amazingly simple it's worth every penny in my eyes, though, honestly, it wasn't that expensive. The SnugRide Car Seat in Finch ($70) and the Verb Stroller in Sapphire ($80) are such pretty colors, too! The "Must Haves": these are things that, while I probably could have gotten by without them, I don't think my sanity would have stayed intact. 1. Halo Sleepsack Swaddle - $20-$30 - We have tried to swaddle using the muslin. Tried and failed. The nurses make it look so easy, but I do not have the magic touch they do. So when it came time for bed the first night after being in the hospital I pulled out one of these babies, and we've used them every night since. Thank God for velcro. 2. Boon Grass Drying Rack - $15 - My relationship with nursing has been complicated, so bottles have been necessary. And where there are bottles there are so many little parts. I had originally bought this just because it was cute, but I ended up appreciating it So. Much. 3. Fleece Blankets (Monsters Inc.) - $20 - This is just one of the many fleece blankets we have. I use them everywhere, in the car, on the couch, on the floor... they are just so nice to have. 4. Nuk Infant Pacifiers - $4 - Pacifiers are a bit weird. 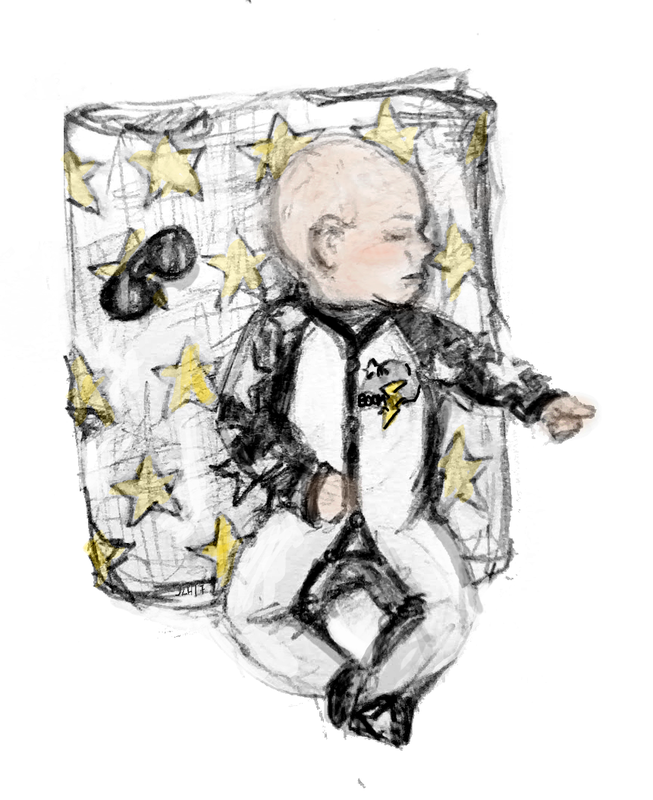 I felt like I was giving up when I gave one to my son for the first time, but I've since learned that they are actually beneficial for the baby, and help prevent SIDS when used during bedtime. These Nuk ones are great because they still have the tip that doesn't constantly get spit out like some of the others I've tried, but they don't leave a mark around his mouth. 5. Monster Snap Up Terry Sleep and Play - $8 - Snap up footies are our favorite thing to dress our kid in. They keep his feet warm, have easy access for diaper changing, and can be taken on and off easily while the kid is flailing. This particular one is my favorite. It's cute, comfy, and is one of the few things that he's been able to wear consistently for the past two months. 6. Fisher Price Infant-to-Toddler Rocker - $45 - While I'd love to be holding my son all day, sometimes you just have to get things done. This rocker is great to be used as a place to set your kid down when you need to be an actual functioning adult. We keep the kickstand down and drag it into whatever room we are in. 7. Hooded Towel from Ikea - $8 - Our first few bath times were pretty upsetting for our boy, but as soon as we cuddled him up in this colorful towel he quieted right down. 8. Wipeable Changing Pad Cover - $15 - When accidents happen, this is the type of cover you want. A little leak can be cleaned up easily, without having to go through the trouble of replacing your changing pad cover. The "Good to Haves": these are the things that I don't really need, but we have them and I've been really pleased with them so far. 1. Travel Electric Pump - $30 - We had some trouble with getting our pump through our insurance, so in my case this was a must have. I use this little thing regularly and it has held up well. 2. Plush Washcloth Set - $6 - These soft washcloths made bath time a more enjoyable experience for everyone involved. It helps that they're adorable! 3. Pacifier Clips - $6 for 3 - We are constantly losing pacifiers on the ground, so a good pacifier clip is a must. I love the colors on these, and they are constructed well. 4. Vornado Baby Nursery Heater - $100 - A pricey item, but this keeps our whole upstairs heated. Safe and cool to the touch, this thing is an adorable powerhouse. It's also got a little sensor to attach to the crib to make sure that temperature is maintained where it is needed the most. 5. Munchkin Changing Pad Liners - $8 for 3 - I love these so much I thought about putting them in the "must have" section. Having one of these down means the small leaks and messes that happen don't require you to change the whole changing pad, which is so nice. It also keeps the baby's head warm when you're using the wipeable changing pad. 6. VTech Audio Baby Monitor - $30 - This little monitor is great at picking up even the smallest coos. The one I've linked has two parent units, meaning we can keep one upstairs and one down. I love to use this while I'm doing dishes and he's in the crib. I feel like he's safe without me having to be right next to him. 7. Diaper Genie - $25 - This was actually one of those things I was convinced I didn't need. 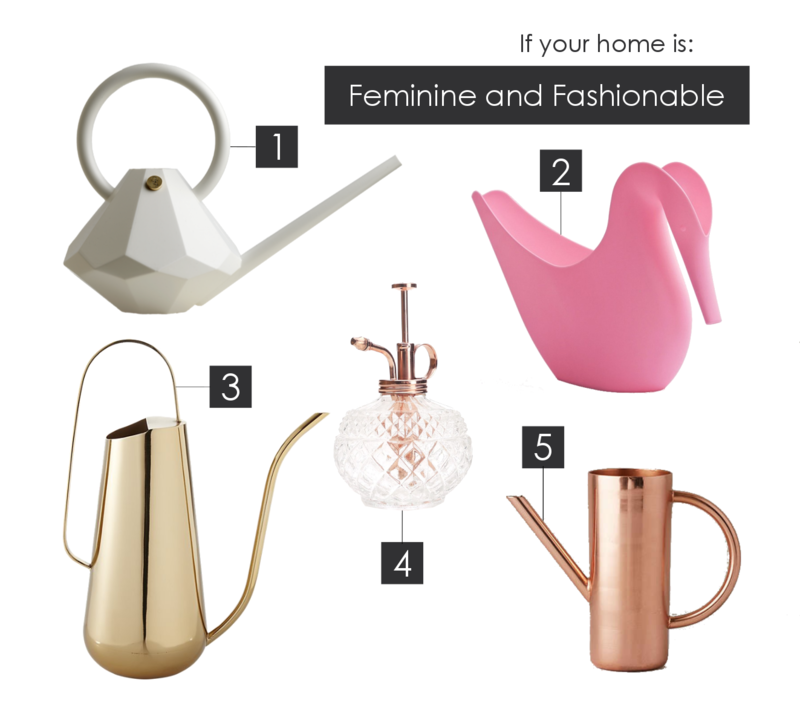 I was just going to go buy a lidded trash can and call it a day. But in the end, the Diaper Genie was about the same price, but with the added benifit of making my nursery not stink. The refills are a little pricey, but you can find cheaper versions that work just as well. OR you can also use plain old trash bags if you use this method from Mother's Realm. 8. Lifefactory Bottle - $12-$15 - This is just... cute. I've dropped it and it didn't break, it's super easy to grip, but in the end I like it because it's just so cute. 9. Ikea Changing Pad Blanket - $5 - Okay, I just realized I have listed 4 different things for keeping poop off of things but that's pretty much what being a parent is about. This one is great to tuck into my diaper bag and put onto the changing tables when we're shopping or at a restaurant. This post "How to Rock Out a Newborn Schedule" from Mighty Moms was so helpful for me, mainly because after I read it I finally felt like I wasn't doing everything wrong. It's very frank real talk, while still being generally upbeat. High contrast videos are helpful when babies are fussy and need a bit of a distraction. Obviously, I can't plop him down in front of the screen for hours, but a few minutes of videos will give me time to breathe. This video from Hey Bear is awesome, or, if you can't stand that music, try the video for Seven Nation Army by the White Stripes. Both are baby tested, Mom approved in this house. Oh, and if you're wondering how we ever survived without the Dock-A-Tot, a pillow is a wonderful thing. This is my "I'm a newborn mom and I'm just excited that I remembered to brush my teeth this morning" look. Maternity leave chic? Eeeehhh more like maternity leave eek. 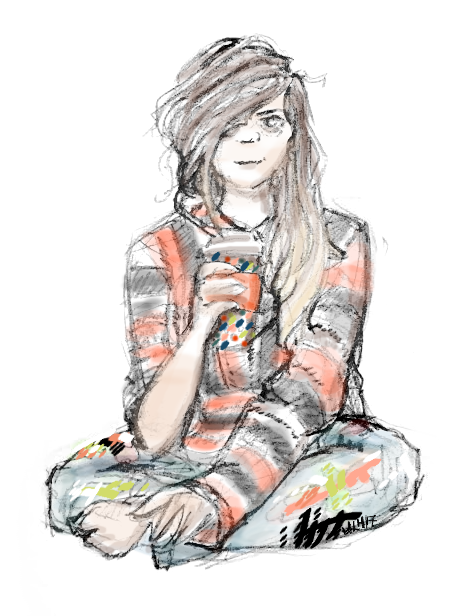 So this classy outfit features some crazy roots, a hoodie my parents got from Colorado (similar here), paint covered paints, and iced mocha coffee in one of my super adorable disposable cups from Brit + Co for Cheeky. And here is one of Ronan's outfits. He looks MUCH cooler than me, and he's only 8 weeks old. 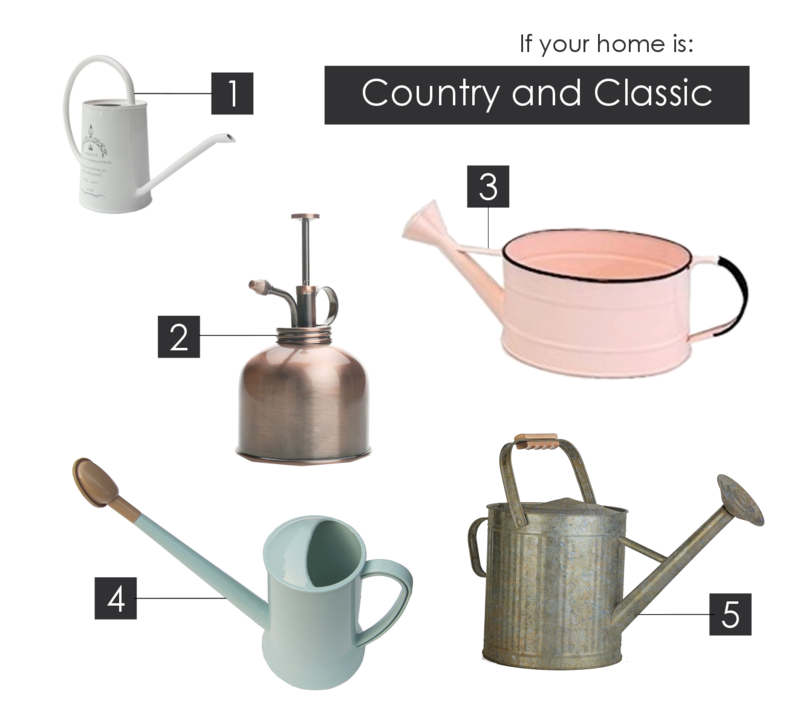 Now that I've moved my very few plants inside and can't just rely on mother nature to water them I find myself in need of a watering can. I mean, sure, I can use a cup, but where's the fun in that? 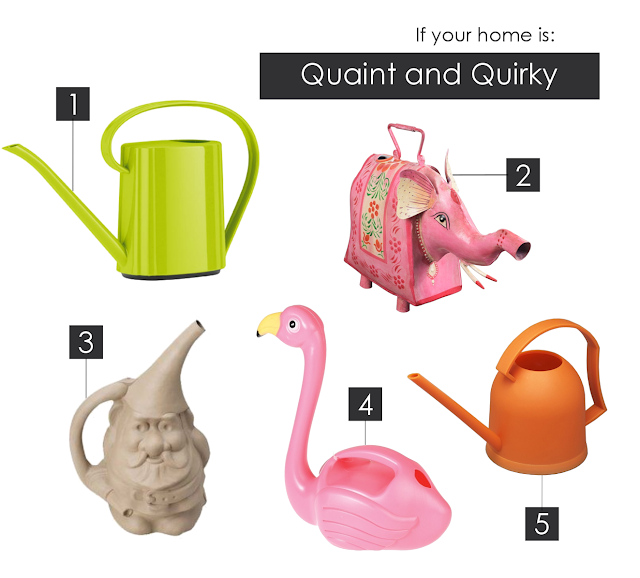 My hope is that buying a cute watering can will help me remember to water my plants regularly. I want my lemon tree to grow, dang it! And there you have it! I think I might get one of those misters. Then again, that gnome is too cute. Arg, I can't decide. Which would you get? The life of a bookworm is a magical one. You get lost in crafted worlds that catch your imagination and leave you there for days. But what if you could capture that magic and bring it into the real world? That's what these gifts do. 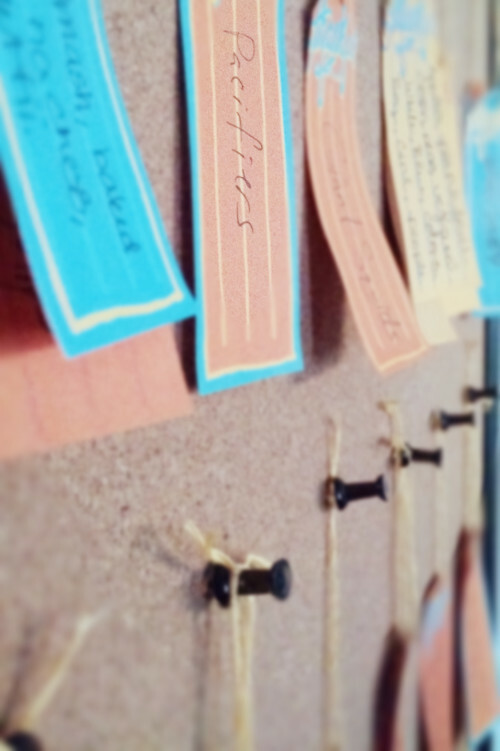 Lately, I've been inspired by interactive installations. I love that the art pieces that are formed as much by the participating audience as by the artist themselves, like this piece installed in the Make-A-Wish Foundation's Seattle office. 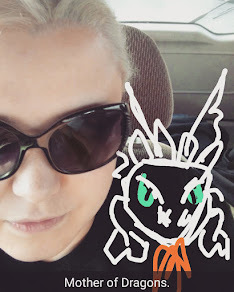 I really wanted to make one for myself, but obviously, I don't have a gallery to display such a piece in. But what I do have is a house and a holiday coming up. So I ended up making some small installation piece to be used during Thanksgiving, which double as really easy Thanksgiving decorations. 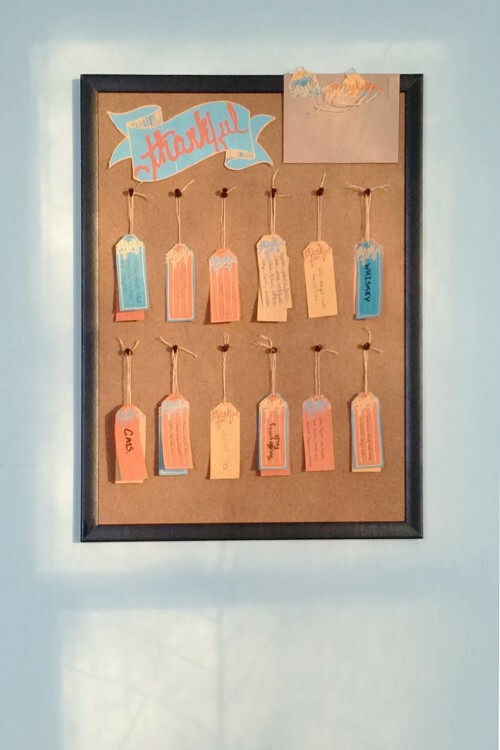 These are just simple tags that ask people what they are thankful for. Hang them in your living room, in the doorway, from the ceiling above the table, anywhere that needs some extra this holiday season. If you would like to add these to your own home, scroll down to get the link to the pdf! 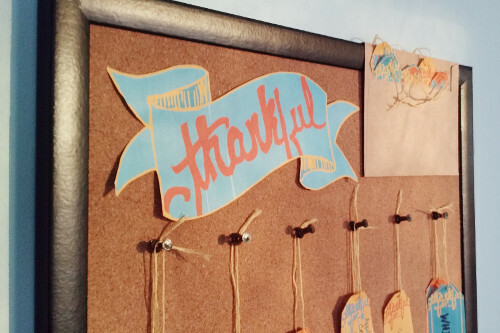 You can download the thankful tags kit here. 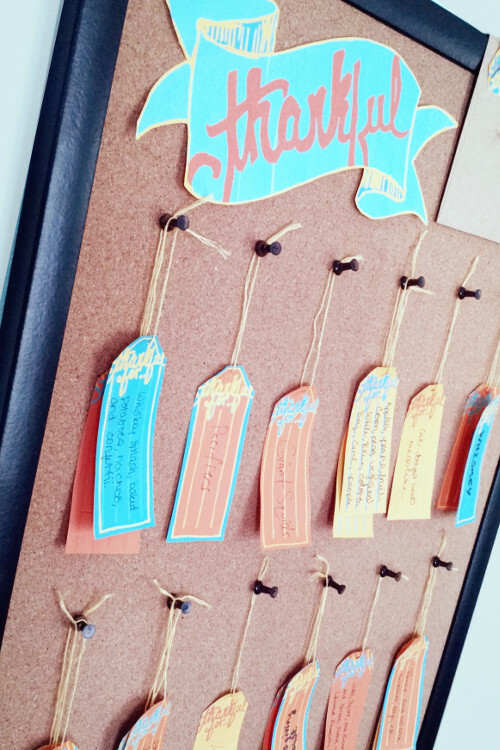 Bonus: These tags match the Thanksgiving Kit I created two years ago, which includes a gratitude journal, place cards, and invites! You can download the Thanksgiving kit here. Monsters have always had a place in my heart. There's something about misunderstood creatures that just makes me want to cuddle them up and show them some love. If you've met my cat you know it's true, show me a monster and I will try to give it a hug. This love instigated calling Ronan "little monster" while he was still in the womb. Of course, our boy has so far turned out to be not a monster at all, with a wonderful disposition (last night he slept for 7 hours. What baby does that!? ), but the name has stuck. So, in honor of our "little monster" being born, I've dreamed up a few activities that are perfect for a rainy (or snowy) afternoon. There's a bunch of printable parts, so you can either download just what you want to use, or download the full kit (link at the bottom of the page). I personally recommend downloading the whole kit to share with your own little monsters! All right, we are going to get our monster day started with a couple games. Both of these activities will use the die I have created, so you'll need to print that out and fold it up. I usually fold it to make the cube and then put see-through tape on all the seams. The first game is called the Monster Wiggle. Turn on some music, and have your kid roll the die. Whatever "part" it lands on is the part they need to wiggle. The great thing about this is not only is fun, but it gets there brain working. It takes some imagination to choose where their spikes (for example) would be, so encourage them to pick out the spots on their own. The second game is intended for children a bit older. 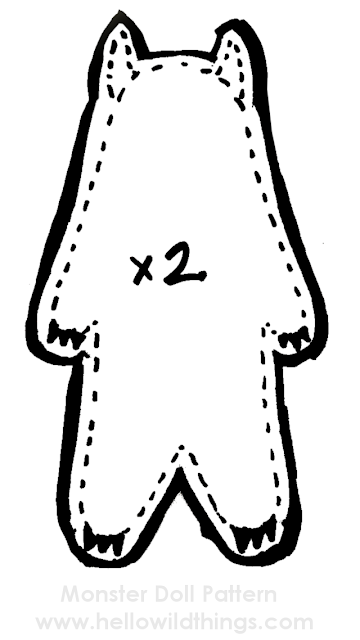 For this activity you will need the monster die, a regular 6-sided die, and a pre-drawn monster coloring sheet. You can either print out the one I have created or have the kids draw their own. I know all that wiggling would make me hungry, so I think it's time to talk about a snack. 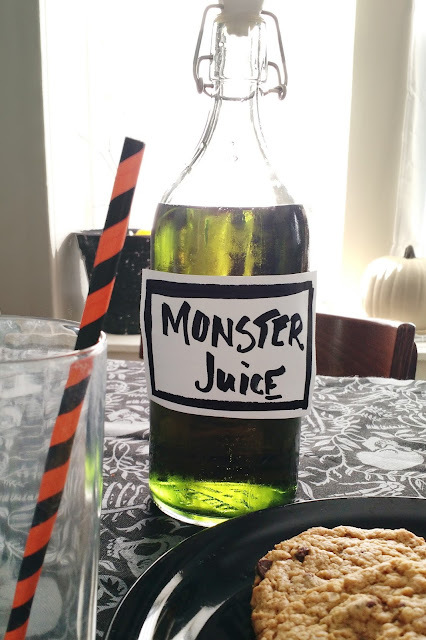 Any juice can be made into "monster juice" by adding food coloring. And everyone knows that monsters love cookies, so be sure to give your kids a giant one! You might even be able to sneak in oatmeal and raisins! 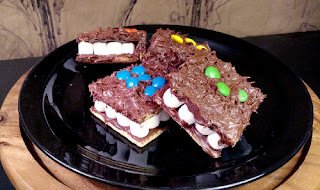 Or, if you're up to trying something a little bit more complicated, check out my "Monster Book" snack tutorial here. To take snack time up a notch, put a customizable monster doll on your kid's plate to greet them (directions for this DIY are below)! After snack time comes craft time! I've got two crafts created for this kit. One is a mask and takes minimal prep time. Just print out the sheets. 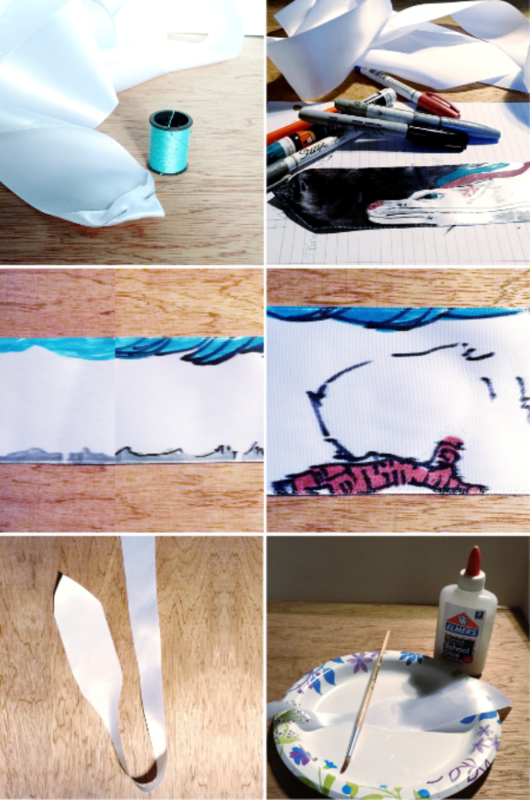 If your kids can use scissors let them cut everything out themselves, if they can't have them pick out their favorite parts, then you can cut them out for them to color. 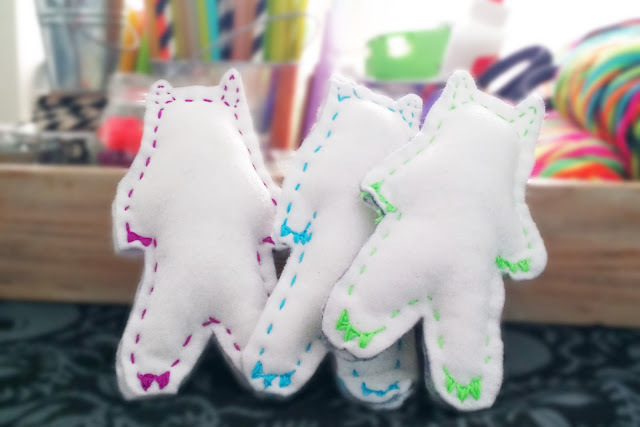 Step one: Print the pattern and cut it out, then trace and cut two monsters out of a felt color of your choice. Step two: Use bright colored embroidery floss to sew around the edge. 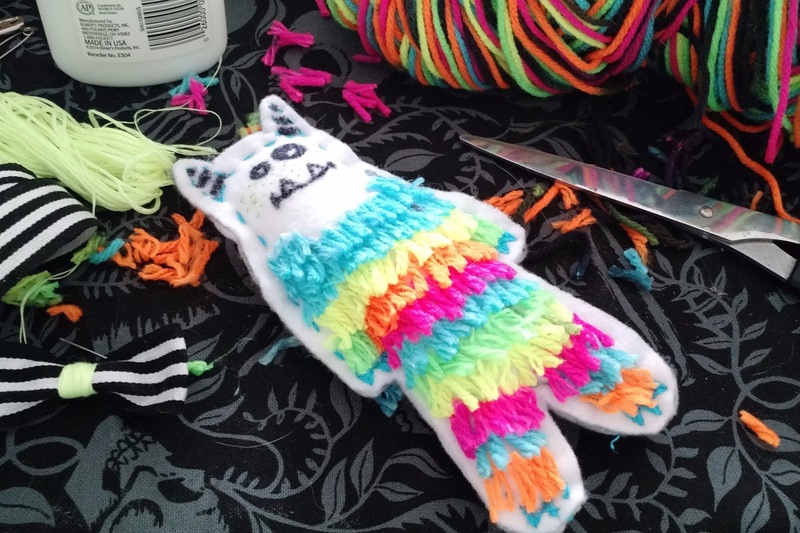 Since this is a monster, stitches don't have to be perfect. Leave open some room at the top, use stuffing to give your monster some padding, sew around the curve of the head, then come back for the horns. Optional: Embroider little claws at the end of its hands and feet. Actually knowing how to embroider doesn't really matter here. Just keep going over your stitches until you have a solid triangle. Step three: Decorate! If you're using tacky glue or school glue leave at least 24 hours to sry. School glue does not hold as well as tacky glue, and hot glue is the best. To make mine hairy I glued rows of yarn across his body using school glue. It was tedious but turned out cool. 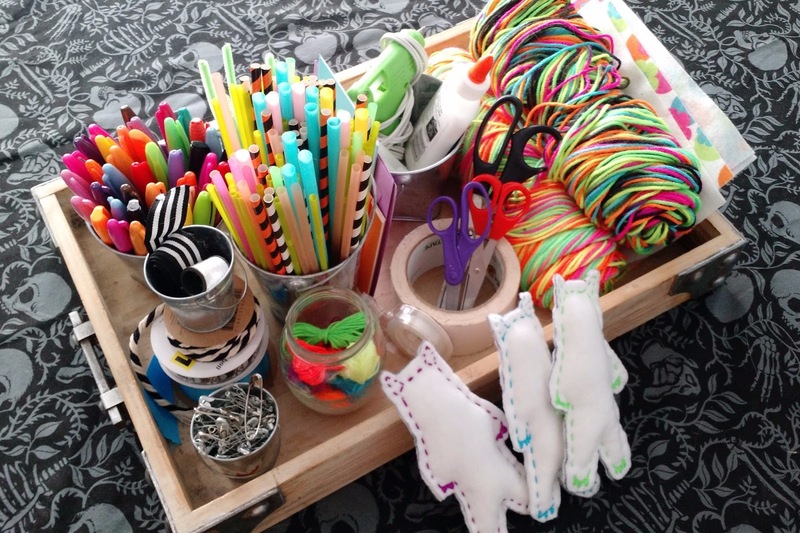 If you're trying to do this activity with really little ones, skip the craft supplies all together and just provide some fabric markers. No day is complete without storytime, so I'm wrapping up this monster party with a list of my favorite monster books. Reading these out loud is a blast, especially There's a Monster at the End of this Book and Don't Push the Button. Make sure to check your local library to see if they have any of theme. They are worth the time, I promise. 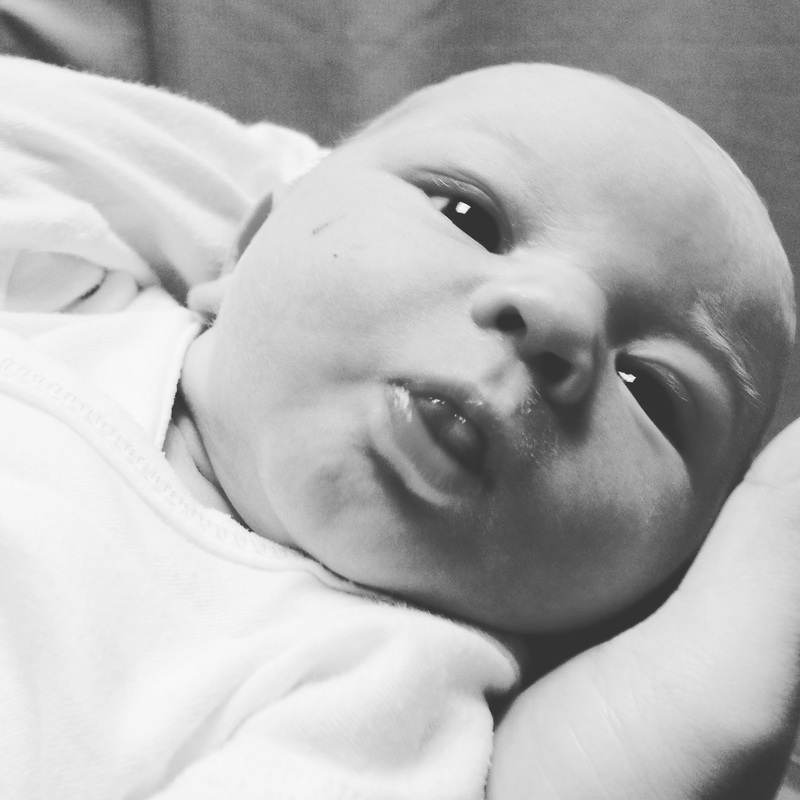 I'm not going to do a full-on birth story here because that's just not my thing, but I did want to jot down a bit of a story so I could look back on it later. Onto the story! It begins a little randomly, with a little bit of explanation. Adam owns a Trans Am, and my beautiful baby is a Mitsubishi Eclipse. Both of these have very limited back seat room, so our transportation was kind of a problem. We'd been searching for cars for a while, but finally got to the point where we had to choose. Like now. So among all the other chaos that was our lives last week, we went car shopping. It was stressful and dumb and we have a beautiful new-to-us SUV but I'd rather never go to a big car dealer again, thank you very much. Anyways, I think Ronan knew that was the last piece of the puzzle, though, because after I went in for my appointment Thursday (where I had scheduled to be induced the next Monday) I started feeling uncomfortable. I figured it was just from checking my cervix, which had left me feeling pretty ug before, and moved on. My mom and I walked around the stores a bit and then went home, where Adam and I made some spicy chilly and went to bed. So the uncomfortableness never really left. At 1:00 am I figured I just had to poop. By 5:00 I was googling "what do contractions feel like" because I had always been told that they'd hurt my back and kind of travel from out to in, and these just felt like stupid bad cramps. By 7:00 Adam had basically become the only logical one (I was still in denial) and had started prompting me to get ready. By 8:00 I couldn't stand, and by 9:30 we were in the car. I white knuckled the whole hour we were driving to the hospital. When we actually got there everyone was super sweet and so supportive and I'm guessing I was making some pretty intense "I'm in pain!" faces because they all were very supportive and kind. I got into my hospital room at around 11:00 and got an epidural which, for me, worked instantly and was very lovely, lasting right up until about the time I needed to push. Labor went well, and Ronan was born at 5:30 pm. 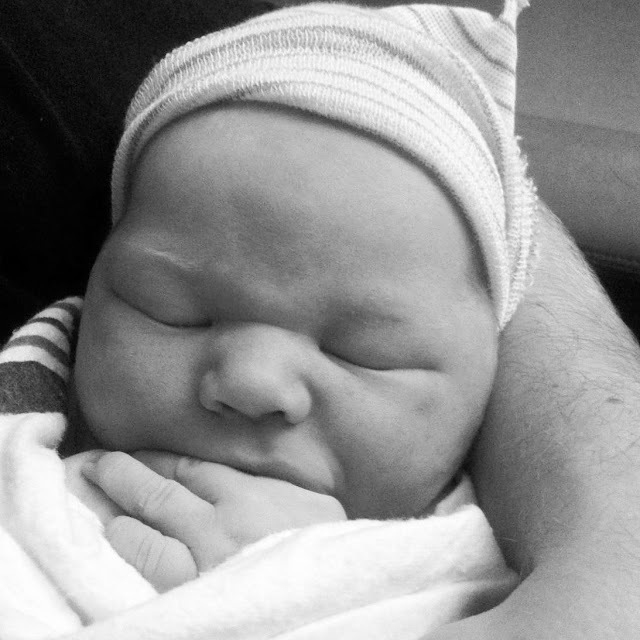 8 pounds, 11.5 ounces (yeah, ouch). 20 3/4 inches. Breathing, crying, perfect. We decided to stay in the hospital for the whole next day and night and get discharged on Sunday morning. But when Sunday rolled around, the doctor came in and told us that Ronan hadn't pooped yet. At all. She explained that this could be caused by many things, some serious, some not so serious, and that they would like to put him in the nursery to be monitored overnight. At this point Ronan had only left our side for a few check-ups, and he had never been gone for more than an hour. I had had very little sleep. They were telling me they were going to take away my baby. So I totally cried. A lot. The next few days were incredibly stressful. 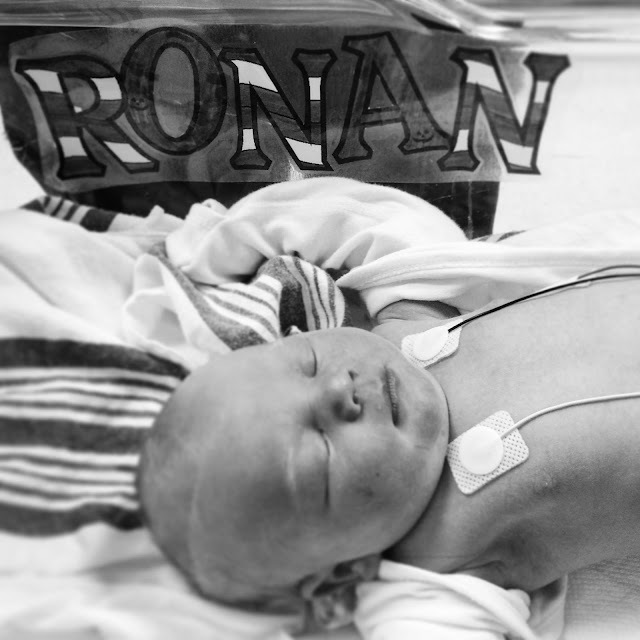 The issue with Ronan was probably just blockage, but he was going to have to go through some tests to make sure. For me, it was just 2 days and nights of shifting between my room for a half hour of fitful sleep then back to the nursery to nurse. Exhausting, both mentally and physically. Eventually, they did a test that helped clear out the blockage, and everything in his little body went back to normal. Amazingly, he honestly didn't really act that unhappy when he was all blocked up. It was like his stomach was a black hole. It was so weird. All of the nurses were instantly enamored with him, and they all helped us through this whole ordeal so well. I honestly don't know what I would have done without them. Probably just straight up went crazy. We finally got to take Ronan home on Tuesday. 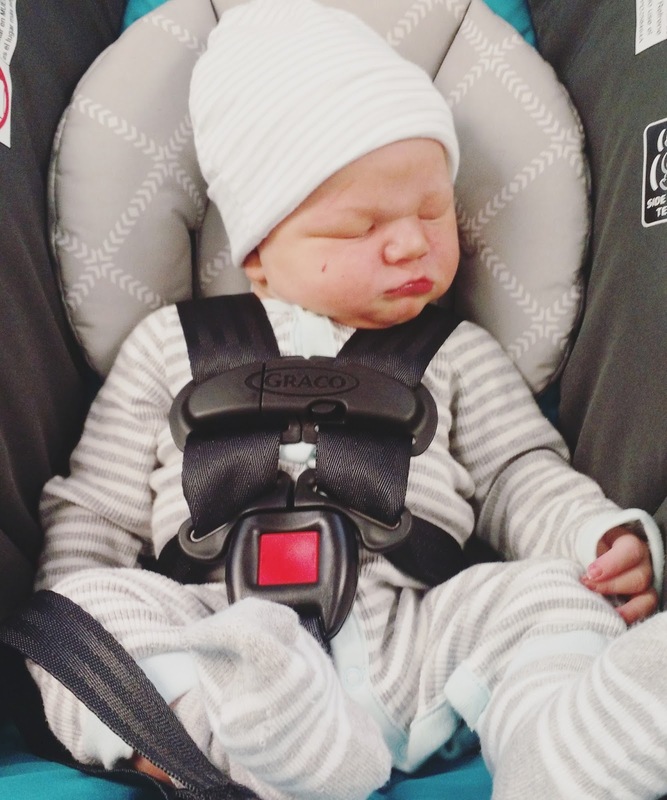 The car ride home was peaceful, and the adjustment to being home with a newborn, while still stressful, was nothing compared to those worried filled hours in the hospital. Now we are two and half weeks in, and everything has calmed down a bit. We are still figuring a lot of things out, but I already couldn't imagine life without him in it. Every time I watch Spirited Away I wind up thinking to myself "Chihiro would be such an easy costume to make." Chihiro, in case you are not familiar, is the adorable main character from this wonderful Hayao Miyazaki animated film. When Chihiro's parents are turned into pigs she will do anything to save them, including caring for a filthy river spirit, defeating a swarm of paper birds, and dealing with adorable soot sprites. Like all of Miyazaki's films, this is a trip into a dreamland that will leave you full of delight and wonder. But when I actually sat down to think about putting together the costume it always felt too simple, like it was missing a piece. Then, while watching the film at a movie night more recently I realized that Haku the dragon resembled a ribbon when he was flying. So thus the Haku ribbon dancer prop was born, adding that extra layer of "wow" to a simple-to-make costume. 1. Fold the top f the ribbon into a triangle and sew a few stitches to keep it together. 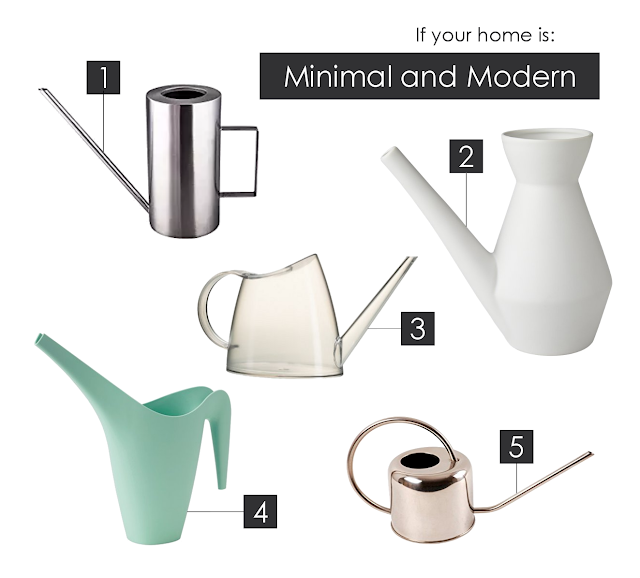 Nothing fancy required. 2. Draw the details of Haku's face. (He has a snout like a dog with two long whiskers coming out of his cheeks, and a mane of teal hair. Definitely look up some reference images for this one.) Shade the leftovers area with black. 3. At the opposite end of the ribbon, cut a taper leading to a feather shape for the tail. Wherever you cut the ribbon, paint the edges with glue to seal. 4. Divide the ribbon in half and then in half again to find leg placement. Draw the legs (which are dog legs), with the feet (chicken feet!) in pink. 4. Color the fur in teal across the top and in gray across the belly. When you reach the end transition the gray fur into teal. 7. Color in the tail (I followed the basic layout of a feather). Feel free to line the whole drawing to make it pop. 9. Attached the ribbon to the dowel. I used an eye hook, but there is a gap the thread can slide off of. You could also use a strong straw or just a plain old stick. The most iconic part of Chihiro's costume is the stripe around her torso and sleeves. 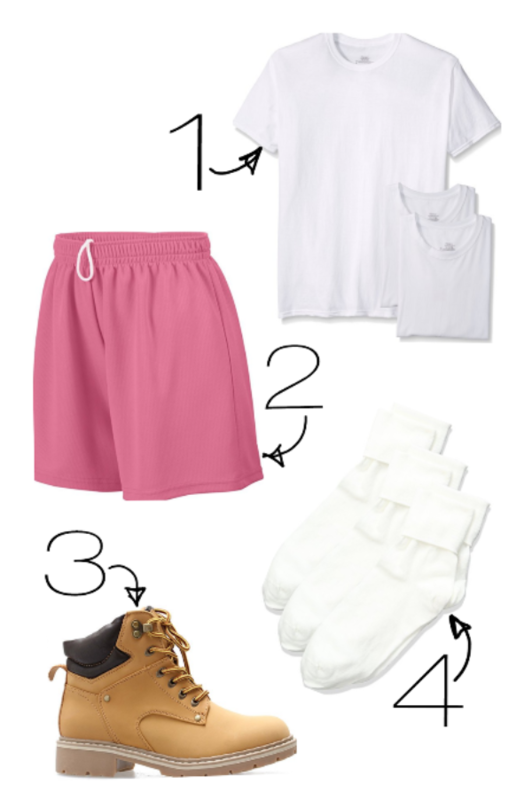 Get that and pink shorts and you've pretty much got it. 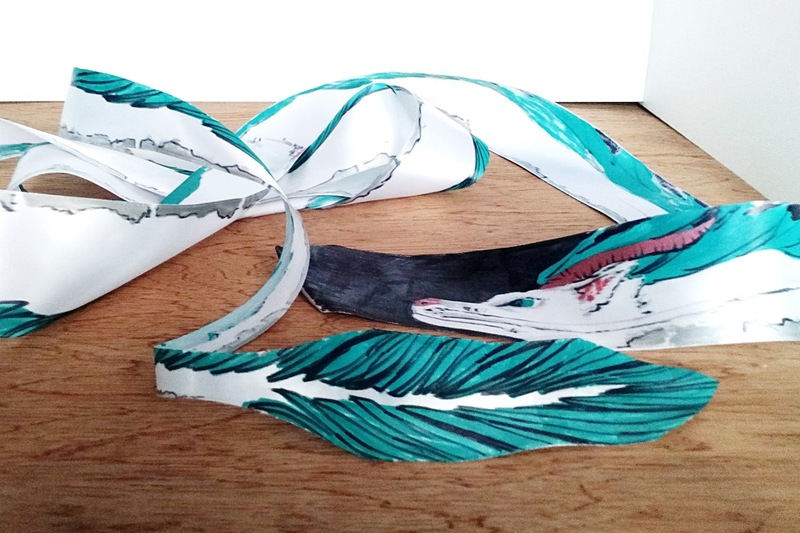 Add the Haku prop and you'll be instantly recognizable as the beloved character. to dance the night away at a zombie ball! One night quite a few years ago we were struck with the notion that it would be a grand idea to hold a ball for the undead. I mean, why do the living have all the fun? So we put together a fabulous soirée that left the teenagers talking for months. For this event, we transformed the basement meeting room into a haunted ballroom. 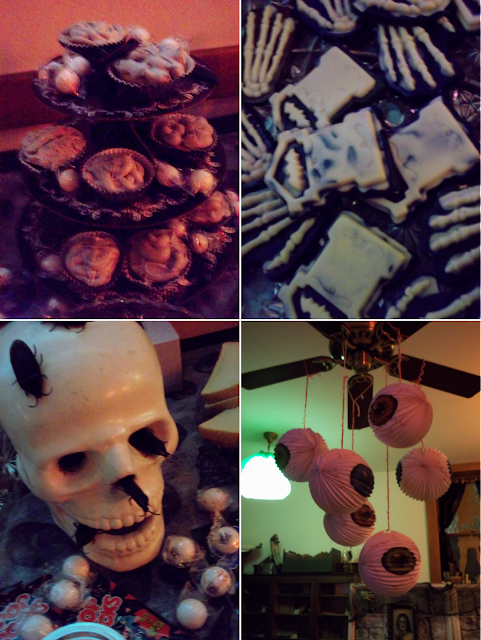 Decorations included cockroaches and maggots, candelabras, an eyeball chandelier, and bones scattered throughout. And of course, our favorite stand-by, cheap plastic table clothes over the lights. 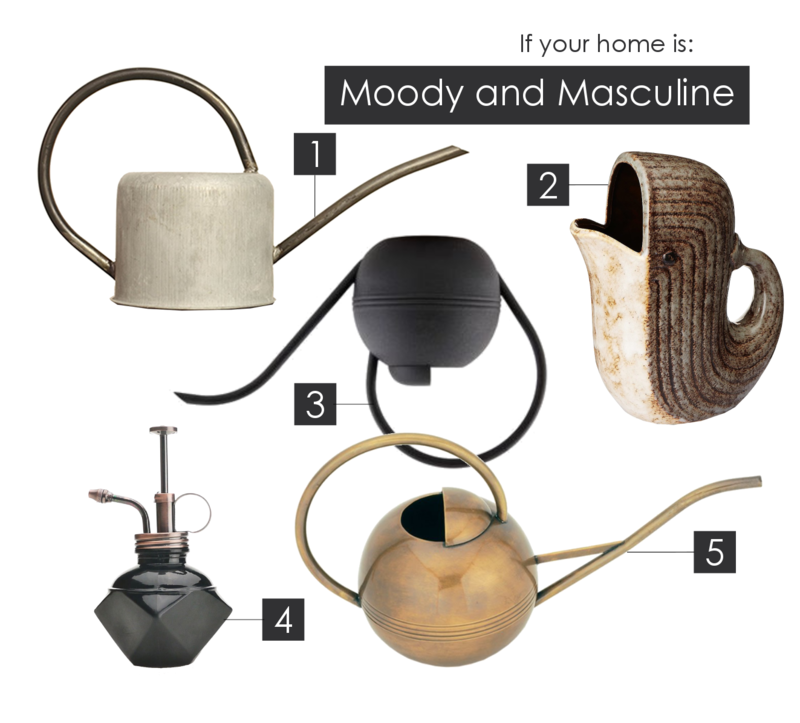 This is a great way to add instant atmosphere to any room. You do have to be careful about this and keep an eye on the lights, but we've never had any melt or burn. We also collected all the creepy things we could to set up little sets for photos, including gravestones from the high school's prop room. For entertainment during the ball, we had a XBox 360 set up with Left 4 Dead in the foyer. In the main room we projected Dawn of the Dead onto the wall without sound to help with the ambiance. Of course, food is the most important part of any teen program, so the walls were lined tables full of ghoulish treats. Brain cupcakes, gravestone chocolates, and some sandwich supplies including "rotting" (sprayed with a bit of green food coloring) bread. We also asked a local flower shop to save their dying flowers and were able to make lovely corsages and bouquets for everyone who attended. Towards the end of the night we took our zombies for a walk around the town square to get some more photos. It was great to see the reactions of people out and about, and the kids had fun while still being entirely respectful. I think the best part of this event is that it was all so photogenic. The sets paired with the lighting made for some really awesome shots. This was long enough ago that it was before the whole Instagram phase (I told you it was a while ago!) so I'd almost like to do it again just to give the teens the opportunity for those epic selfies. 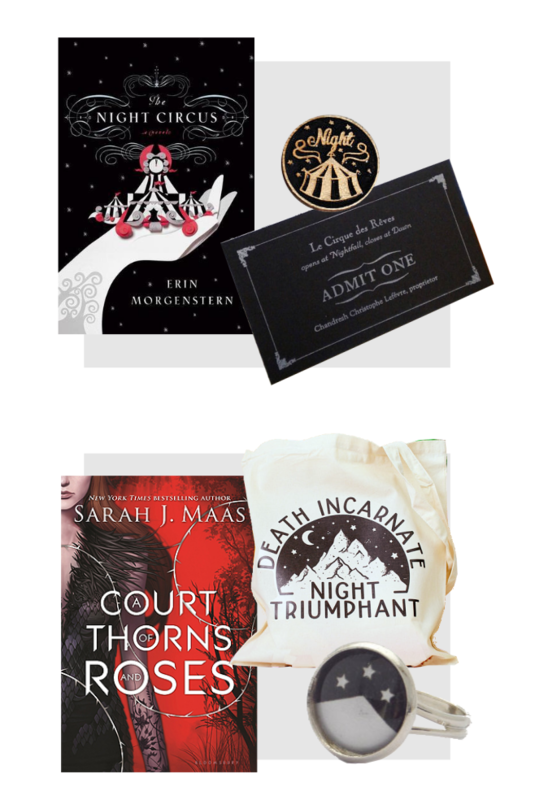 If you'd like to host your own zombie ball and are looking for some books to fit the theme, here is a great list we put together for our Tumblr.